In accordance with O5-Order 4002-29, this documentation is sealed to all personnel without Level 5 clearance. In addition, Level 5 personnel are encouraged not to access this file without a pressing reason or instruction from O5-1. Your current access credentials are #ID O5-1. Warning: Impersonation of an Overseer and unauthorized access of this file are both offenses meriting severe repercussions, up to and including summary execution. Special Containment Procedures: All information directly regarding SCP-4002 is to be expunged from the general database, with the sole exception of a sealed file accessible only by members of the O5 Council. Should any unauthorized individual obtain information regarding SCP-4002, purposefully or otherwise, they are to be terminated without exception. Newly discovered artifacts containing selections from the Sumerian King's List are to be immediately confiscated and examined by Mobile Task Force Alpha-1 ("Red Right Hand"). Any references to the Seed of Life, King Etana, the Black Moon, or to information associated with any of the former are to be falsified or destroyed. A Kholoud-memetic trigger has been implanted in all living humans. It is transmittable through biological reproduction, several figures of speech, and the use of amnestics. All humans created through the activation of the Ganymede Protocol are pre-implanted with the trigger. When activated, the trigger will cause the subject to utter a vocalization related to the nature of any present anomalies affecting them. Should any subject respond to the trigger with a simple affirmative statement, SCP-4002 will be considered uncontained. At this time, re-evaluation of core Foundation principles and operating procedures will become necessary. Description: SCP-4002 is a non-permanent agreement between Etana, a Sumerian king of Kish who reigned at some point prior to 3000 B.C., and a hostile deity of unknown identity. The exact date when the deal will expire is currently unknown. The recovered portion of the Sumerian King's list, colorized. Kish has finally yielded her secrets to us, with the enclosed portion of the Sumerian King's List being the most pertinent to our current efforts. I admit to being skeptical we could actually discover ancient anomalies after the failure in Saqqara, but I'm now convinced you were correct. The list fragment was buried with the preserved corpse of an eagle whose wingspan exceeded 30 feet! The list, both before and after the Flood, follows a simple format of name and reign length. Except one. And in that very one, a direct mention of the Seed itself. This king Etana is the road that will lead us to our quarry. Bright, Zartion, and Loyd will be pleased. I've directed all of our staff in the region to search for artifacts bearing his name. It has become obvious that we are but on the threshold of the discovery. And I refuse to rest until the truth is in our grasp. After the flood had swept over, and the kingship had descended from heaven, the kingship was in Kish. In Kish, Jucur became king; he ruled for 1200 years. Kullassina-bel ruled for 960 years. En-tarah-ana ruled for 820 years. Puannum ruled for 840 years. Kalibum ruled for 960 years. Atab ruled for 800 years. Macda, the son of Atab, ruled for 840 years. Arwium, the son of Macda, ruled for 720 years. Etana, the shepherd, he who ascended into heaven on Eagle's wings, he who made firm all the lands, he who was granted the Seed of Life, became king; he reigned for 1560 years. Balih, the son of Etana, ruled for 400. "Let Etana be their architect"
No throne daises whatsoever had been constructed. Kingship, the radiant crown, and throne. He brought order and knowledge. Proud of their younger brethren. "I saw a dream, the City of Kish was sobbing." "Within it, the people were in mourning." "They sang a song of lamentation." "Oh Kish, giver of life! Etana can not give you an heir!" "O Shamash, you have dined from my fattest sheep!" "O Netherworld, you have drunk of the blood of my sacrificed lambs!" "I have honored the gods and revered the spirits,"
"Dream intepreters have used up my incense,"
"Gods have used up my lambs in slaughter." "O Lord, give the command!" "Grant me the Seed of Life!" "Reveal to me the plant of birth!" "Relieve me of my burden, grant me an heir!" "Find a pit, look inside,"
"An eagle is cast within it." "He will carry you to highest heaven, where you may beseech the Annunaki." Project Lazarus nears completion, but you have yet to deliver the key to its success. Carter and his lieutenants have made unacceptably slow progress in the past decade, even accounting for the delays of the war. The recovered fragments of Etana's history give us no more insight on where we can find the Seed than we held previously. Carter's obsessive insistence that the information about early humanity's interaction with anomalies will prove valuable is tenuous at best. We already know human history is nothing more than a brief window after dozens of millennia of anomalous chaos. You said it yourself in our damn founding manifesto. We are on the verge of a final victory over the anomalous. An assurance that no petty god or fae plague will push us back into the darkness. More anomalies are appearing every year; if Lazarus is not finished then everything we've done will soon be rendered pointless. Loyd doesn't see the whole picture here. The seed is irrelevant compared to what we are learning. We are assembling an accurate account of Humanity's relationship to the anomalous. 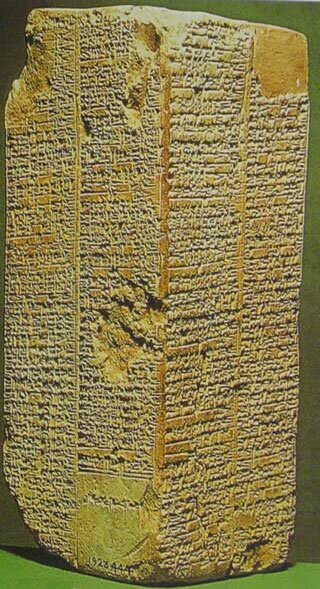 The discovery of the Eridu tablets has changed everything. It was a sight surpassing all precedent, and one we never dreamed of seeing. You speculated at our founding about humanity and the anomalous, but what if you were wrong? And what if we can answer the one question that you couldn't? Why did the anomalies' numbers dwindle at the dawn of civilization? And why are they rising again now? Why did this civilization spread and grow to become modern man, when all attempts before it sank back beneath the dirt? I'm investigating a newly discovered ruin at the site of Agade, and I believe it to be a preserved cache of Sargon himself. If anyone can finish the story of one of the first kings, it is the first emperor. Give me time, please. I shall send updates of our excavation through courier or parcel once we are under way. My city was Azupiranu, which was situated on the banks of the Euphrates. The river bore me up and carried me to Ur-Zababa, King of Kish. I was raised up by his will, and slew him for his crimes upon my father and home. And also for those crimes of his ancestor Etana, whose deeds I must destroy. I have buried his truth beneath the altars of the fallen gods. I will unite the four quarters of the world to restore what was lost. My blood shall reign for 1000 years. They will hear the Black moon howl. He said so much and so little, but he knew the truth. The altars means Nippur, city of temples. I'll find it. All we have to do is peel the shrines like an onion, and we'll finally know what price was paid. He'd have been disappointed at his heirs, lasting only a fifth of his vision. But it has been so much longer than that now. Does this Black Moon howl today? Your concerns are noted, and some among the council share them. You are to accompany Carter on the dig in Nippur. Assist him in his efforts, but do what is necessary to ensure the project is successful. Carter's goals may no longer be our own. Should his termination prove necessary, the false insurgents will be blamed. On March 3rd 1921, Director Loyd attempted to flee the dig site after injuring Agent Carter and several others. A detachment of RRH in their insurgency guise intercepted Loyd four kilometers from the premises and he was terminated after firing upon the task force. But the Mother would not give him the Seed. But each would not give him the Seed. She was imposing and beautiful of feature. Under the throne lions were crouching. For she was Shamash, and the eagle and Etana did obeisance together. "Shamash, why do the Annunaki refuse me?" "King of Kish, that power is not meant for you!" "You will live long, and then another blood must reign." Etana was cast out from the gate. No god in heaven would help Kish. On Eagle's wings, he ascended above heaven. Beyond the sky, the Black Moon. before the throne carved of ichor. "I know what you seek, and I will give it to you." "But l must be given a gift as well." "You desire it not for yourself, but for your people." "They will bear me a gift in your stead." "Kingship will reign in Kish, and order in Man." "But for an age you will give unto me your nature." "The beasts shall fall silent, and the Annunaki fade." "Time's call will be heard, and the deathless shall die." "To rise you will fall, and my howl shall resound." "As the soul you have sacrificed will return." "You will know the age is done, when you hear the Black Moon's howl." And Etana fell back to the earth, as Eagle could no longer hear him. Seed in hand, Bilah was born unto Kish. But his life was far shorter than his father's. O5-1: You've heard the account. How do we proceed? O5-3: You're certain we can trust this? It could be any old mythological hogwash. O5-2: There's no doubt. It fits too well with the scattered accounts we've recovered from the Children of the Night about the interregnum between our civilizations. They never made sense before. O5-8: Because we didn't know the truth about our own natures. O5-6: Was everything we've done pointless? Are we just hypocrites in the end? O5-1: We've always been hypocrites, this merely extends the scale. But it doesn't change what we have to do. O5-11: Even if that means we've been locking up the only "normal" ones this whole time? O5-5: Right or wrong, I can't turn back. If I do, it means everyone who've died have been sacrificed for nothing. Can anyone here stand that weight? O5-12: I don't give a damn what an anomaly is in an empirical sense. It's an anomaly to our society, and that should be enough. O5-7: Hear, hear. What we once were does not change who we are today. O5-4: And what happens when the Black Moon howls, which this seems to imply will be soon? O5-1: Most likely, we fall. But on a timescale as long as this, even relatively close may give us centuries. No reason to despair over this when any of a hundred anomalies could end the world on any given day. In the meantime, we set precautions and try to create a warning system. It is all we can do. O5-13: There may be one recourse we can take to counter this threat, though it is not a guaranteed success. O5-1: What do you propose? O5-13: We have the Seed now, and with it the chance to complete Project Lazarus. Project Thaumiel and its component parts were intended solely as a failsafe, but with proactive use it may delay or prevent this event. O5-10: …Agreed. Let us replace a blighted crop with a cutting of its former self, as many times as is necessary. 1. Another name for Sumerian deities, sometimes used synonymously with the Igigi.